* Mariell presents fabulous clip on wedding earrings with bold pearl drops. * The tops are a glistening demi hoop of inlaid cubic zirconia set in rich silver rhodium. * Every store should stock these sophisticated bridal or mother of the bride clip on earrings offered at an affordable low wholesale price! * Stylish dangle clip ons are not easy to find so make sure to add these popular earrings to your store's collection! 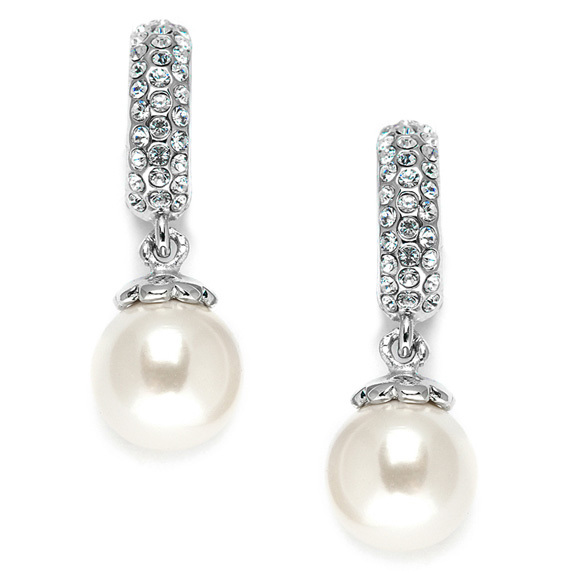 * Marielll's 1 1/4" h wedding Clip On earrings have gorgeous Cubic Zirconia demi hoops with 12mm soft cream pearl drops. * Chic clip on wedding earring are hard to find so don't miss these perfect bridal or mothers of the bride clips at a great price!